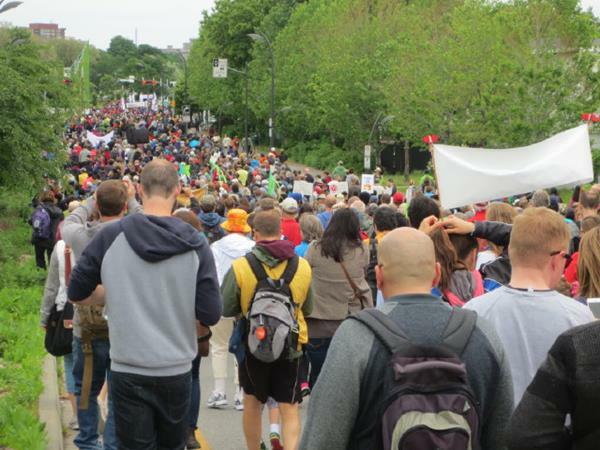 Quakers from Ottawa and beyond, some of whom are pictured here, were a very few of the 10,000 Indigenous and Settler peoples who walked in the Walk For Reconciliation, on May 31st in Ottawa. The walk was one of the activities that were part of the release of the Truth and Reconciliation Commission’s (TRC) report on the experiences and effects of Indian Residential Schools in Canada. It was amazing to walk with such a diverse and committed community! The summary findings of the TRC in English can be found here. Clerk of Canadian Yearly Meeting, Elaine Bishop, attended the release of the report on behalf of Canadian Quakers. She invites everyone to respond to the invitation issued by Chair of the TRC, Justice Murray Sinclair, to walk the path shown by the TRC up to the mountain peak of reconciliation even though it will take more than this generation.